Galaxy Note8 Security Settings - You can set up and settings Samsung Galaxy Note8 security easy using your face, with fingerprint, or iris to unlock your device and learn here how to setup, settings and use in your new Note8 with our tutorial and get simple tips and tricks. Samsung Galaxy Note8 has a multiple security options make it safe and secure. 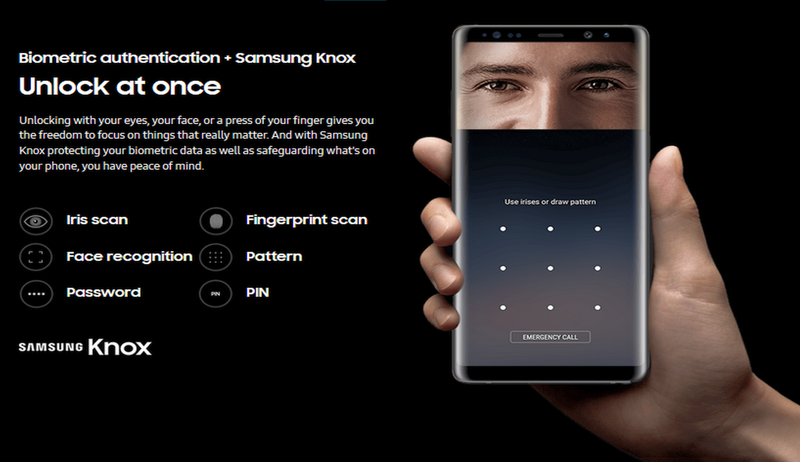 With the Galaxy Note 8, you can set it up to unlock via facial recognition, iris scanning, fingerprint, pattern, PIN, password, and Google Smart Lock. The Note 8 is easy to secure, and there is no reason not to keep it locked down for just your own use. Samsung continued commitment to safety in this Galaxy Note 8 2017. Samsung official continues to uphold its commitment to lead the industry in better battery safety for Note8. The Galaxy Note8 battery has undergone Samsung’s 8-Point Battery Safety Check process. Samsung have been closely working to make meaningful advancements in the science of smartphone quality and safety evaluation. The new Galaxy Note8 has successfully completed a rigorous series of device and battery safety compatibility test protocols. We look forward to maintaining our strategic relationship with Samsung to help ensure device safety for all consumers, it said by Mr. Sajeev Jesudas as a President, UL International. The Galaxy Note8 bring a new business innovation to the next level with features for performance, productivity and security for a wide range of industries, simplifying how work gets done with non-contact authentication. 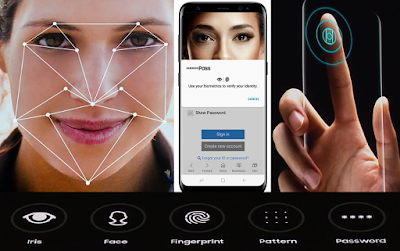 Do it on Galaxy Note8 iris scanning for professionals for example, in health care, construction or public safety, who need to unlock their phones without having to swipe or scan a fingerprint and use enhanced S Pen for Business. The S Pen lets professionals discreetly take notes in Screen off memo or quickly annotate documents and photos. Labeled by Note8 Flexible Security, simple to choose by your face, fingerprint, or iris to unlock your device on easy to use. You can unlock Galaxy Note8 using face, fingerprint, or iris to setup please read the tutorial below in article. Configure facial recognition security to add an extra layer of security when using your Galaxy Note8 settings. Use your fingerprint as an alternative to entering passwords in certain apps. You can also use your fingerprint to verify your identity when logging in to your Samsung account. Use iris recognition as an alternative to entering passwords in certain apps. You can also use your eyes to verify your identity when logging in to your Samsung account. The easy way to unlock Note8 and entering passwords in certain apps use face recognition. You can set the device to use Face Recognition to unlock the screen by recognizing your face. Face recognition is less secure than a pattern, PIN, or password. Your device could be unlocked by someone or something that looks like your image. Some conditions may affect face recognition, including wearing glasses, hats, beards, or heavy make-up. When registering your face, ensure that you are in a well-lit area and the camera lens is clean. To use your face to unlock your device, you must set a pattern, PIN, or password. 2. Tap Settings > Lock screen and security > Face recognition. 3. Follow the prompts to register your face. Remove face data: Delete existing faces. Samsung Pass: Access your online accounts using face recognition. Face unlock: Tap On/Off to enable or disable face recognition security. Face unlock when screen turns on: Unlock your device with face recognition as soon as the screen turns on. Faster recognition: Turn on for faster face recognition. Turn off to increase security and make it harder to unlock using an image or video of your likeness. Use fingerprint recognition as an alternative to entering passwords on Note8 in certain apps. You can also use your fingerprint to verify your identity when logging in to your Samsung account. Note: Fingerprint recognition uses the unique characteristics of each fingerprint to enhance the security of your device. The likelihood of the fingerprint sensor confusing even small areas of two different fingerprints is very low. But in rare cases, the sensor may recognize a fingerprint that is similar to a registered fingerprint. How to Register a Fingerprint on Galaxy Note8? To use your fingerprint to unlock your device, you must set a pattern, PIN, or password. You can register up to three fingerprints. 2. Tap Settings > Lock screen and security > Fingerprint scanner. 3. Follow the prompts to register your fingerprint. Fingerprint verification can be used for other accounts accessed from your device. To rename a fingerprint, tap the fingerprint, enter a new name, and then tap Rename. To add a fingerprint, tap Add fingerprint and follow the prompts to register a fingerprint. To delete a fingerprint, touch and hold the fingerprint, and then tap Remove. Confirm when prompted. Samsung Pass: Access your online accounts using your fingerprint. Samsung Pay: Use your fingerprints to make payments quickly and securely. Fingerprint unlock: Tap On/Off to enable or disable fingerprint security. Use iris recognition as an alternative to entering passwords in certain apps. You can also use your irises to verify your identity when logging in to your Samsung account. Some people may have dizziness, seizures, epileptic seizures or blackouts triggered by light flashes or patterns, even if they have never had a seizure or blackout before. Anyone who has had a seizure, loss of awareness, or other symptom linked to an epileptic condition, or has a family history of such symptoms or conditions, should see a doctor before using the Iris scanner. Do not stare directly into the infrared iris recognition LED as prolonged use can cause eye strain. Do not stare at the iris recognition LED light when your eyes are less than 20 cm (~8 inches) away from the device, for best results keep your eyes between 25–35 cm (~10–14 inches) away for optimum recognition. The Iris scanner is not intended to be used as a medical device and the biometric data collected and stored locally by the mechanism is not intended to be used for any diagnostic, therapeutic, or preventative purposes and follow all instructions for use of this feature for best results, remove eyeglasses and sunglasses. Do not use the Iris scanner in bright sunlight or areas with excessive reflected light (for example, by the pool or seashore). Do not use the Iris scanner in low light. Look straight at the device (not up, down or sideways), and hold your head still for the scan. Tinted contact lenses and surgically repaired or replaced iris lenses may interfere with operation of the Iris scanner. Do not walk or operate a vehicle while using the Iris scanner. For more information, refer to the online support content or visit samsung.com/us/irisscanner. To use your eyes to unlock your device, you must set a pattern, PIN, or password. For best results, perform the set up process indoors, and remove your glasses or contact lenses. To register iris on Note8 just one of your eyes, tap the link on the setup screen to register one iris. 2. Tap Settings > Lock screen and security > Iris scanner. 3. Follow the prompts to register your irises. Iris verification can be used for other accounts accessed from your device. Remove iris data: Delete existing irises. Preview screen mask: Choose a mask to display when using the iris scanner. Samsung Pass: Use your irises to verify your identity using Internet and other supported apps. Samsung Pay: Use your irises to make payments quickly and securely. Iris unlock: Enable to unlock the device using your irises. Iris unlock when screen turns on: Unlock your device with your irises as soon as the screen turns on. Tips for using iris recognition: read and view video tutorial on how to use the iris scanner. If you’re going to buy the Galaxy Note 8 this year, you should probably deactivate the face unlock feature because Samsung’s newest phone suffers from the same security problem as its predecessor. We heard the Note8 can be unlocked with a photo, if someone already has a picture of you, then it’ll be able to easily bypass the phone’s security when you’re not looking. In fact, even Facebook photos shown on a smartphone screen will do the trick but we not tested for this security ulock by photo. It appears like a minor thing, something that can't in any way, shape or form influence you, as the future aggressor needs physical access to your telephone to hack it. In any case, it's the rule of the thing. This is a component that is intended to secure your gadget and it has a noteworthy defect. In the event that that sounds natural, that is on account of the Galaxy S8 experiences a similar issue. It would seem that Samsung didn't successfully settle it since propelling the Galaxy S8.You reset Note8 your phone if got any problems. In case you're pondering whether Samsung thinks about the issue, you should realize that it does. It's extremely mindful that face opens aren't sufficiently secure to be utilized with Samsung Pay, which is the reason its versatile installment framework doesn't bolster the component. Apple's iPhone 8 will likewise accompany a facial acknowledgment framework, a first for the iPhone. In any case, the handset will incorporate 3D profundity sensors that will keep anybody from hacking the gadget with only a photograph. The Galaxy S8 and Galaxy Note 8 likewise accompany iris scanners that are apparently more secure than confront opens. Be that as it may, programmers were additionally ready to break the Galaxy S8's iris sensor in the relatively recent past.